The unlimited wristbands allow guests to enjoy all the tracks and attractions as much as they want during their time here. With a variety of go-kart tracks for participants of all ages, an indoor arcade, rock climbing and much more, the NASCAR Speedpark is an interactive entertainment complex that the entire family can enjoy. The unlimited wristbands allow guests to enjoy these attractions to their heart's content. The 8 tracks of varying skill level and height restriction ensure that everyone will find a race as challenging or calm as they enjoy, while 16 other attractions offer plenty to do once the thrill of the raceway wears off; if that can even happen! 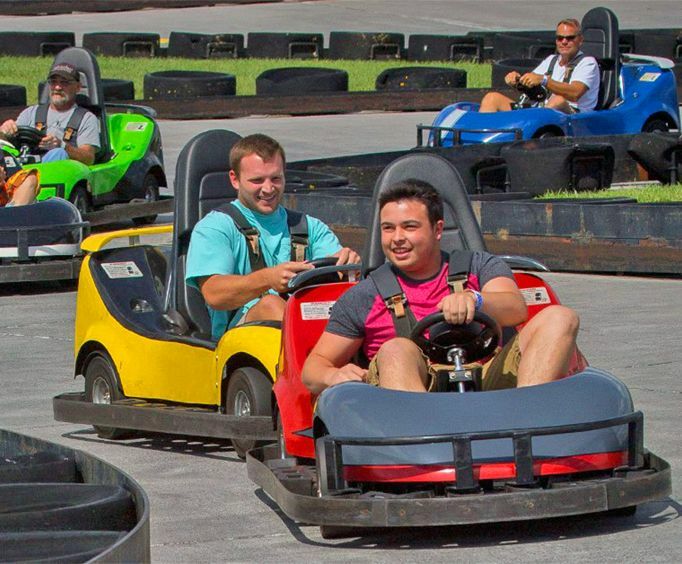 Add excitement and thrills to your next vacation in the Gatlinburg - Pigeon Forge area with a visit to NASCAR Speedpark. Smoky Mountain Speedway - This track runs a quarter mile and is in a D oval shape. The cars are 3.8 the scale of an actual Sprint Cup Car. Drivers must be 60' tall and 16 years of age with ID. The Competitor - Short track with high banks. 60' height requirement for drivers of double karts; 54' for single seaters; 40' for passengers. The Intimidator - Named after Dale Earnhardt. 54' height requirement. SlideWayz - 750-foot slick track. 54' height requirement for single-seater karts. 60' double seaters. Passengers must be 40'. Family 500 - Hourglass road course. 60' height requirement for single drivers. 60' height requirement for two seater drivers. 40' height requirement for two seater passengers. Young Champions - 1,100-foot track. 54' height requirement. The Qualifier - Beginner track. 44' height requirement. Baby Bristol - 200-foot starter track. 36' height requirement. Spin Zone Bumper Cars - Enjoy this classic carnival ride with your whole family! Drivers must be at least 36' tall. Speed Bumper Boats - Electric powered bumper boats with water shooters. 40' height requirement. Fantasy Golf - Medieval style 18-hole miniature golf course. SpeedDome Arcade - Arcade featuring over 50 different games. Kiddie Speedway - Go-kart track for children. 36' height requirement. 'The Rock' Rock Climbing Wall - Indoor rock climbing with four different climbing experiences. Must weigh between 40 - 250 pounds. The Pro Tow - Thrill ride for children. 36' height requirement. Indoor Playground - Race car themed, soft-play area for children. Rockingham Railroad - Miniature train ride. 36' height requirement solo. No height requirement when riding with adult. Stock Car Carousel - Brightly colored carousel perfect for the whole family. 36' height requirement. Tot Rods - Mini cars for the youngest members of your crew to ride. Height requirement of 36'. Tubs of Fun - Teacup ride that is amazing for the kiddos. 36' height requirement. The Scrambler - Fun spinning ride for kids who are at least 36' tall. Tilt-A-Whirl - This classic ride spins around and around for amazing fun. Children must be at least 36' tall to ride. What is included in the admission price for NASCAR Speedpark? Includes an unlimited wristband for all tracks and attractions. Approximately how long could a customer plan to spend at NASCAR Speedpark? Guests tend to spend 4 - 5 hours here. Is NASCAR Speedpark handicap accessible? For what ages is NASCAR Speedpark appropriate? Is parking available at NASCAR Speedpark? Is it free?